Time sure does fly when you're having fun planning a weekend-long wine jaunt for 30 bloggers and spouses. As early as tomorrow morning, TasteCamp EAST 2009 attendees will start descending on the North Fork of Long Island. The plans have really come together nicely and despite a grey, rainy weather forecast, I think we're going to have a lot of fun. Check back over the weekend and next week for posts about the goings on, but you can also keep up with all the TasteCamp fun on Twitter. I'll try to get a couple wine reviews posted today and tomorrow, despite the craziness, but I hope you'll forgive me if I miss a couple days. Dave Whiting does not simply want Red Newt to survive. He wants it to thrive, and he admits that it's tougher now than ever. "Ten, twenty years ago you could open a winery in the Finger Lakes, open the doors, and be viable as long as the wine was decent," Whiting said after bottling a wine that he thinks will make a serious impact in markets outside New York state. "Now, with more wineries opening and production rising, you have to find ways to differentiate yourself. I don't just want to increase production. I want to focus on what I believe we do best, and before anything else, that's riesling." Offer it at a price point to compete with high-volume producers such as Chateau Ste Michelle and Covey Run. Make it better than those high-volume producers. Ditch the marginal wines, otherwise known as chardonnay and sauvignon blanc for Red Newt. If this works, it could become the model for other mid-size Finger Lakes wineries. Red Newt's riesling production is jumping from 800 cases in 2007 to 2800 cases in 2008, and it should rise to well over 8000 cases within four years. Whiting has contracted plantings with several local growers, and there are now 20 new acres of Riesling in the ground, all of it earmarked for Red Newt. The winery will still produce a Dry Riesling and the Reserve Riesling will sell for around $22, but most of the Riesling production will be devoted to the new, so-called "Circle Riesling" -- the unofficial name is a kind of joke at the winery that comes from the circular label on the bottle. "We think this wine is a breakout wine that will compete extremely well with wines from other regions," Whiting said about his new wine that clocks in at 3.2% residual sugar. The idea came not long ago, he said, when he was in a local wine store. "I walked into the Finger Lakes aisle and everything was about $14 or $15. The Finger Lakes tends to offer a lot more in a riesling when it comes to fruit intensity and structure, but the market is price-sensitive. It's time to enter into a pricepoint that is a little bit lower so we can be highly competitive." Circle Riesling will retail for $11.99. "It's definitely a medium-sweet wine, and that's by design," Whiting explained. "It's similar in sweetness to what you'll find from the high-volume producers, but we think it's much crisper and carries more structure." NExt is ditching the marginal wines. Whiting enjoys a good sauvignon blanc or chardonnay, but it's clearly not where his passion lies as a winemaker. "Every winery doesn't have to make every variety of wine," he said. "Our sales of chardonnay are not huge. It's steady, but I think there are a good number of excellent Finger Lakes chardonnays out there that could pick up the slack for us. Same with sauvignon blanc. Those wines will not be a permanent part of our portfolio." That means visitors won't see a Red Newt chardonnay or sauvignon blanc beginning with the 2009 vintage. "We think our long-term success rides on riesling, then other aromatic whites, and certainly in many years our reds. But it might change from year-to-year, based on the vintage. I just don't anticipate chardonnay or sauvignon blanc being a part of it." Assistant winemaker Brandon Seager warned against getting spread too thin in the winery. "There's a certain danger to being caught in the middle," he said. "We're now making about fifteen thousand cases a year. We're not a boutique but we're not a huge producer. We don't want to lose a sense of what we do best because we're trying to do too much. So we're shedding the parts that are not the core of what we do best at Red Newt." In other words, in the world of wine, a Red Newt must remain a Red Newt -- it can not be a chameleon. The price tag on the Circle Riesling is made to compete with wine from around the world, but Whiting stressed it's not an indication of lesser quality. "We're more focused than ever on quality," he said. "If we weren't we'd have no chance." And when it comes to Red Newt's two single-vineyard Gewurztraminers, which have earned rave reviews, Whiting acknowledged the price tag can be jarring to some consumers -- the Sawmill Creek retails for $36 and the Curry Creek sells for $42. ""There's a real opportuity to offer value at every pricepoint," he said. "This is not just talk. If you're doing it right you're giving the consumer excellent value in each wine. We think that's true for the Circle Riesling and for the Gewurztraminers. Those Gewurztraminers comapre very favorably in quality and price to many highly regarded Alsatian Gewurztraminers, so we're confident our customers will find value in them." Red Newt is patient with the new plan but eager to get started. The Circle Riesling will be on shelves within days. And while the recent critical success helps, Whiting and his staff understand that it is ultimately the consumer, not the critic, who will decide whether their new philosophy is the right one. Well folks, it would appear that my first official review of a 2008 Finger Lakes riesling is of a wine made and bottled by a Long Island winery. Baiting Hollow Farm Vineyard, located in (you guessed it) Baiting Hollow, NY is the first tasting room you come across as you head east on South Avenue/Route 48 and they are often swamped with people on weekend and during the pumpkin-picking season. Baiting Hollow Farm Vineyard and its wines reside somewhere in the middle of Long Island wine. Their wines are often good, not great, and none of them retails for more than $21. In an industry with sweet, magnum-bottled blends of dubious origin on one end and $125 merlot on the other, Baiting Hollow is perfectly middle class. This riesling fits that model a bit too. They are planting their own riesling vines this spring, but as I mentioned earlier, this wine was made from grapes grown in the Finger Lakes. I really like the nose on this riesling. It shows nice green apple and just-ripe peach aromas with a little spicy-floral note in the background. With 2% residual sugar, it's clearly made in the popular "off-dry" style. The flavors are fruity -- apple, peach and a little melon -- but it really lacks the acidity needed to bring balance, especially on the finish where a little citrus peeks through. This is the kind of riesling that will probably fly off the shelf in their tasting room, but I prefer my riesling a bit more racy. May is Riesling Month in Finger Lakes Wine Country and, while the name could use some work, it looks like a great program. Visitors in the tasting room will be able to do a side-by-side tasting of the winery's semi-dry and dry rieslings in both the regular tasting room glasses and glasses that Riedel produces specifically for riesling. I'm not a believer in varietal glassware yet, but this should be interesting. Visit Rooster Hill's website for details. Ravines' co-owner and winemaker, Morten Hallgren, is one of my favorite makers of Finger Lakes riesling, so this dinner, which includes 4 courses for $75 should be outstanding. Visit the Ravines website for more information. Owner Scott Osborn and winemaker Peter Bell will lead diners through a special riesling-focused meal. Visit the Fox Run website to make your reservation. It's not every day that you get a chance to taste a decade's worth of riesling from one of the Finger Lakes' best producers. I wish I could make the drive up for this one. RSVP required via the Wiemer website. This walk-about tasting offers the chance to taste riesling from more than 40 New York wineries paired with local cuisine and includes a special tasting of older-vintage rieslings. Tickets are $55 via nywcc.com. Join winemaker David Breeden and taste rieslings from several vintages, including a preview of the unreleased 2008 rieslings and library wines that are no longer available anywhere else. Tickets required via Sheldrake Point's website. Again, you can see a full list of the events here. I probably won't be able to take part in any of the above events, but I will be able to attend the trade-only Riesling Summit at the Astor Center next Tuesday. The Summit includes a guided tasting that will compare the best Finger Lakes rieslings with those from other top regions in the world, followed by the Aromatic White Wine Showcase, a walk-around tasting of Finger Lakes aromatic whites that will include currently available 2007 wines, special samples of soon-to-be-released 2008 wines and several older vintages. When it comes to Long Island sauvignon blanc, there is a small group of wineries that can be counted on to deliver consisten quality. Macari Vineyards is one of those wineries and puts out one of the region's best sauvignons. This is a wine that I look forward to every spring (when its released) and drink plenty of all summer long, even if I don't eat all of the great local shellfish that this wine is seemingly destined to be enjoyed with. Most of the grapes than went into Macari Vineyards 2008 "Katherine's Field" Sauvignon Blanc ($22) come from their Block K (Katherine's Field), which is the part of their vineyard closest to the Long Island Sound between 100 and 150 feet above sea level. Farmed to 2.5 tons per acre, the fruit was hand harvested, steel fermented and malolactic fermentation was strictly avoided. This year's wine is far lighter in color that previous vintages. The green-yellow is so light that the wine is nearly colorless. The nose is nicly citrusy and grassy with hints of basil and gooseberries. On the palate, it's a bit more delicate than past years, but it shows tremendous balance between citrusy fruit flavors, savory herb and grass notes, and snappy, lively acidity. The finish is lengthy with persistent saline minerality that the best Long Island sauvignon often has. As I mentioned last week,I was asked to judge the Hudson Valley Wine & Grape Association's 5th Annual Hudson Valley Wine Competition over the weekend, and I have to tell you, I had a blast doing it. I met some great people for the first time, including the Hudson Valley Wine Goddess, Colleen from Brotherhood Winery, Brian Simpson, Tish and the Beer Wench. The wines entered in the competition need to be made with 100% New York State grapes, preferably grapes grown in the Hudson Valley. 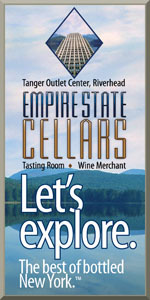 There were 80 entries from approximately 15 Hudson Valley Wineries. There are some very good wines being made with Hudson Valley-grown grapes, not just fruit purchased from Long Island and the Finger Lakes (though that is still widespread). Judging at least 60 wines (I wasn't counting) is hard work. Fun too, but still hard work. It's true what they say about wines with 'something different' standing out. There was a cabernet with a distinct rosemary-eucalyptus note that I kept coming back to. It really made the wine stand out in that flight. Red hybrids can bring some great flavors to the table, but wow, their acidity can be mouth slashing. Some interesting fortified dessert wines too. Most of the white hybrids are still too sweet. The overall quality, at least of the wines I tasted Saturday, seem to be improving. Cabernet franc might be the grape of the future for the region. And boy can judges differ in how they score wines. Amazing just how much. Once the results are posted (and I get copies of my scoresheets back) I'll share more details on specific wines. I'd like to thank the organizers for inviting me to judge and I look forward to judging the competition again next year. In addition to the wine aspect of the day, it was interesting to see just how interested (for the most part) people were in hearing about blogging and Twitter. I turned 34 for Sunday, but my birthday celebration was spread out over two weekends. First, we had dinner with friends at Kitchen -- A Bistro, our favorite BYOB place with amazing food, two Saturdays ago. The wine of the night, which was delicious with both my chestnut parpadelle with duck confit and my venison tenderloin, was Roanoke Vineyards 2003 Cabernet Sauvignon. I have one more bottle left and as tempting as it is to open it soon, I don't think this wine is even peaking yet. Then on my actual birthday, we took Jackson out to wine country, not for wine, but for cheese and vegetables. Our first stop was at Catapano Dairy Farm so Jackson could visit the goats and we could pick up some of their ridiculously good fresh cheese. This is some seriously good goat cheese people. If you're on the North Fork, get some. You won't be sorry. After stopping at Garden of Eve Organic Farm to pick up our CSA share we had some friends over who couldn't make dinner the previous weekend. We had some great wines, mostly Finger Lakes rieslings, but the one that stood out was Sheldrake Point's 2005 Riesling, On a hot summer day, it was refreshing and surprisingly complex. So thanks to everyone for celebrating my birthday in various ways. We'll do it again next year. A quick review of a very affordable local sauvignon blanc this Monday morning. I really liked the 2006 edition of this wine for it's light, easy-drinking style and price. Well, Osprey's Dominion Vineyards' 2007 Sauvignon Blanc ($13) keeps the price down in the "daily drinking" zone and, despite the vastly different growing 2007 growing season, brings very similar aromas and flavors to the table. Even with the ripe growing season, this isn't a big aggressive sauvignon. Intead, light lemon and grapefruit aromas mingle with golden delicious apple and subtle herbs on a medium-intense nose. Medium bodied with fresh acidity, the flavors are fairly simple -- grapefruit, lemon and kiwi -- with just a little herbaceousness. The finish is medium-length with a little minearlity. Tomorrow morning, I'll be up early to be in the car and on the road to Rhinebeck, NY in the Hudson Valley by 5:30 a.m.
Why on earth would I get up so early on a Saturday, especially now that Jackson typically sleeps in later than that? Well, there's a very good reason. One of the best reasons, actually -- wine. I'm honored to be judging the Hudson Valley Wine & Grape Association's 5th Annual Hudson Valley Wine Competition at Terrapin. The festivities begin at 9 a.m. sharp, and I certainly don't want to be late. It will be a long day (we're going to wrap up around 3 p.m. or so) but it will be great to taste a bunch of Hudson Valley wines and also see/meet some of my favorite regional wine blog peeps, including Debbie, Tish and Brian. Should be fun. Expect a report next week. Of the 40 or so producers on Long Island, only a handful make pinot noir, and of that handful and even smaller group does it well. Osprey's Dominion Vineyards made one of the best in the 2005 vintage, one of the better vintages in the relatively brief history of Long Island wine. Winemaker Adam Suprenant didn't bother making it 2006 and with good reason, it wasn't a great year for reds. But Osprey's varietal pinot noir made a return with the warm, dry 2007 growing season. That ripeness certainly isn't hidden at all. This Osprey's Dominion Vineyards 2007 Pinot Noir ($40) is a medium-dark garnet and has intense dark fruit aromas of black cherry, pomegranate and cranberry, subtle notes of lavender and whisps of smokey, toasty oak. The palate shows a deep core of rich black cherry, a little bit of that smoke from the nose, vanilla and cinnamon spice. Fine-grained but still grippy tannins and okay acid combine to bring structure. The finish is medium-long but there's a little raw oak on the end. Right now, I think the oak is a little too noticeable, but this is still a young wine so that rawness will probably fade. Once it does, this wine could rival that beautiful 2005. Slowly but surely, Long Island wineries are getting into social media. There still aren't any blogs worth noting, but Juan E. Micieli-Martinez, the winemaker at Martha Clara Vineyards has launched a new YouTube video series, Juan-Maker. It's not the most educational video in the world, but its entertaining. Juan has already been good for MCV's wines, so anything he can do beyond that is really just a bonus. I'm curious to see where he takes Juan-Maker. What do Wine Critics and Bloggers "Owe" Wineries That Send Them Samples? If you're in the wine industry and you're not on Twitter yet, I won't call you an idiot, but you're really missing out. There are great discussions going on almost every day and by getting involved in them, you can not only learn from other people in the industry but also connect with your customers in a whole new way. Sure, there is plenty of inane, useless banter too, but it's pretty easy to filter that out once you get your feet wet and understand the technology and the people. Anyway, yesterday there was an interesting discussion amongst bloggers and some of the wine PR folks about expectations and responsibilities in the "wine samples" game. What should wineries (or PR people representing those wineries) expect when they send wines to a writer or blogger? Some don't seem to have any expectations, which is probably the best way to go, given how some reviewers conduct themselves. Others, and I'm speaking from experience here, expect a published review -- and quickly. Taste the wine in a professional, controlled way. That means I won't guzzle it and not take any notes. Give the winery feedback if they ask, even if I don't publish a formal review here on LENNDEVOURS or in one of my other outlets. The first item is a given, or at least I assume that it is, but several of the PR folks and bloggers seemed (pleasantly surprised) that I consider the second item a given as well. I think of it this way: Yes, the winery wants me to write about its wines, but I also assume that they want to know what I think. I think it's professional to offer that feedback if they ask. I know that most "professional" critics don't agree (or act that way) but I think that's just lazy. It doesn't take me long to type up my raw, unedited notes when a winery emails me wanting to know what I thought of their wine. Wineries, what do you expect when you send out samples? Do you expect something different from a blogger than you do from Parker or WS? Bloggers, do you feel any obligations at all when you receive samples? With only twelve wineries in the Niagara region, news just doesn’t happen everyday. During most of the winter, a few wineries may only open on weekends, or in one case, one weekend out of the month. So now that winter is loosening its grip, some good news has surfaced with the melting snow. The 2009 Finger Lakes International Competition was good to several Niagara wineries, and there was one standout result. Leonard Oakes Estate Winery was awarded a double gold medal for its 2007 Frontenac. If you haven’t heard of this grape, don’t worry, it’s not on Wine Spectator’s radar yet. Bred by the University of Minnesota, this extremely cold hardy grape is meant for the climate of Lambeau Field or other frozen tundras. Leonard Oakes does have small plantings of red vinifera and they are a winery to watch as their young winemaker, Jonathan Oakes, begins to get experience with the family's grapes. I am looking forward to their 2007 Meritage as well as tasting this Frontenac in my next visit to our easternmost winery on the trail. In other goings-on, the official Niagara Wine Trail guide has added two more wineries to the map, both of which are listed as coming in 2009: Black Willow Winery and Victorianbourg Estate Winery have targeted late this year to open their doors to the public. Both are north of the Escarpment and the latter is situated right off of Route 18, Lake Road, a short walk from Lake Ontario. Victorianbourg has planted mostly vinifera including the heartbreak grape, pinot noir. In the near future we will be able to compare pinot from the clay-heavy soils of the escarpment to the lighter gravel soil near the lakeshore. Freedom Run Winery, where I get to help with all sorts of stuff, has released three estate selections last week. These are the first such estate-grown vinifera wines released to the public from the winery. Their 2008 Riesling and naked Chardonnay are still adjusting to the bottle but they are already showing potential. Their estate Pinot Noir from 2007 has been showing well for months and has finally seen the light of day in the tasting room. In fact, this year should see plenty of estate-grown wines in local tasting rooms. Arrowhead Spring, Freedom Run, Spring Lake, Victorianbourg, and hopefully a couple others will release their first wines from estate vineyards. With plenty of area wineries sending samples to wine magazines and competitions these days, I’m sure I’ll be reporting on some scores and medals again soon. Over the last couple years, Brooklyn Uncorked has become the premier Long Island wine tasting event. 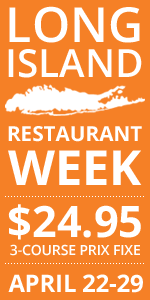 There are very few opportunities to taste so many Long Island wines in one place. This year, the list of Long Island wineries pouring includes Baiting Hollow Farm Vineyard, Bedell Cellars/Corey Creek Vineyards, Bouké, Bridge Vineyards, Brooklyn Oeneology, Castello di Borghese, Channing Daughters Winery, Clovis Point, Diliberto Winery, Grapes of Roth, Harbes Farm and Vineyards, Lieb Cellars, Long Island Merlot Alliance, Macari Vineyards, The Old Field, Osprey's Dominion Vineyards, Palmer Vineyards, Raphael, Roanoke Vineyards, Sherwood House Vineyards, Shinn Estate Vineyards, Sparkling Pointe, Waters Crest Winery and Wölffer Estate. I'll be attending again this year (it's a lot of fun). So, come sample the bounty that lurks in your own backyard. Brooklyn Uncorked runs from 4 to 8 p.m. Members of the public can sample during the 4-hour event for $40. Half price tickets are available for those who purchase a subscription to Edible Brooklyn. Visit www.brownpapertickets.com or www.ediblebrooklyn.net for tickets. Because I have to taste several Kosher wines for WBW #56 tomorrow, today's review is going to be a quick one for a simple, but solid Pindar Vineyards 2007 Peacock Chardonnay ($11). This chardonnay was ermented in stainless steel and with an unknown amount of oak aging (the website doesn't say), this wine is very fruity on the nose with pineapple and pear aromas backed by hints vanilla and even some citrus blossom. As I said, simple, but solidly made, the palate is medium-bodied with more pear-pineapple flavors, a bit more vanilla and just a sprinkle of toasty oak in the background. Good, but not great acidity, brings balance and there is an interesting grapefruit note on the average finish. The tropical, fruity character reminds me a bit of some Aussie chards I've tasted, but there's better acidity here. It's a good example of the kind of wine I'd expect to get if I were to order a "glass of chardonnay" at a bar. Not that I would... but if I did, I'd be happy with this. It's not distinctive, but for $11, it delivers good fruit and enough acidity.